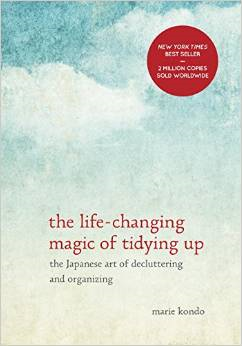 Recently zoomed through the book, the life-changing magic of tidying up by Marie Kondo. An interesting and worthwhile read because Marie offers a fresh look, with some new twists, on a subject that feels like it’s been around too long already. She takes the idea of de-cluttering and shines it up to a brilliant level. The theme of the book is not to throw out to tidy up, but to remove anything that doesn’t delight or give a feeling of gratitude for having it. Marie says once this is achieved you will never step back into a cluttered life and will come to understand yourself better. I requested this book even though I smugly thought we didn’t need it. Not after our massive clean-out sixteen months ago when we downsized. 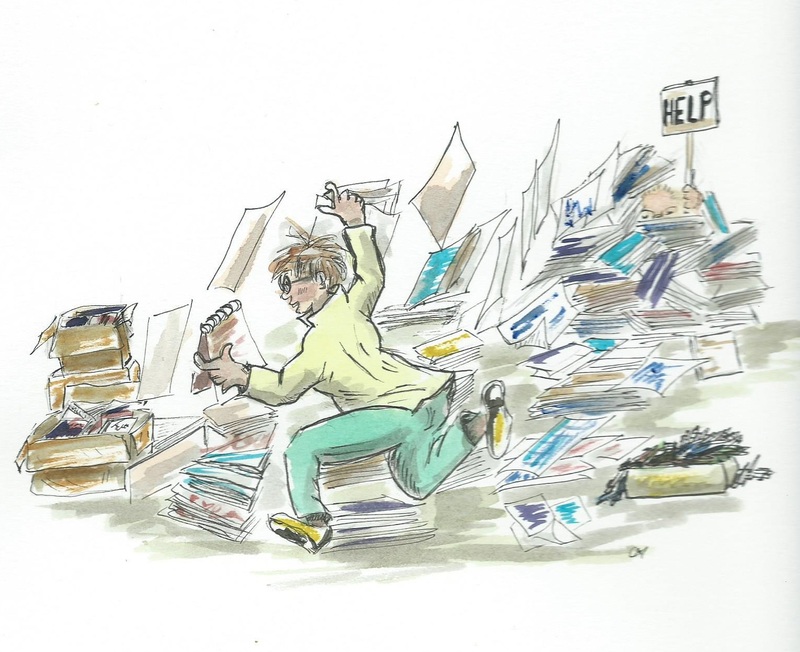 We’ve been living with the smugness of that purge—even as we grew stash(es) of writing and drawing papers, cup-hoards of pens and—OMG—the books! Step one – gather every book from everywhere and pile them on the floor. A sense of guilt because we hadn’t gotten around to reading it yet? A sense of shame because we’d read a few pages before putting it down, thinking we’d try again another time? Only we hadn’t. Or, if we did read it once but because it was pricey we somehow thought hanging onto it would give us a better deal?? A sense of delight, because somehow, someway, the book connected with us? If the answer was one of the first three the book joined the giveaway pile(s). In total, we gave away one hundred and twenty-one books! Now, when we look at the bookshelves our eyes don’t skitter away anymore. We feel a nice sense of wonder and delight we have such great books. Then it was time for the pen stashes . . . oh just tsk tsk tsk. Ain’t weren’t we fine examples of pen-hoarders. A plastic bin, the size of a shoe box, carried away our shameful excess. And you know what? It’s heaven to not pick up a pen that feels like ick. Now, when we pick up a pen it feels good—every single time! I’m glad I read her book. . . and as soon as we rest up from our ink-loaded endeavour we’ll be tackling our over-the-top passion for paper, pads, notebooks and my personal hoard of pretty papers.